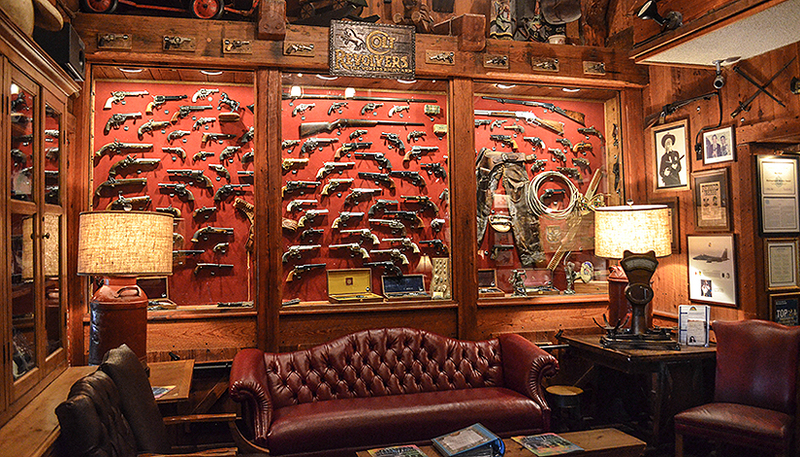 Colt Gun Collection: The west wall of our waiting room houses one of the largest collection of single action colts on the east coast (single action means that unlike the modern revolver these guns had to be cocked before firing). In design and performance, in line and form, no more sculptural and practical Colt has ever been created. Movies serve as constant reminders of the role this equalizer played in winning the West. These are guns and memorabilia that were used by real cowboys, those that portrayed them, John Wayne, Clint Eastwood, Tex Ritter and one that belonged to a pioneer of music, Hank Williams, Sr. There are several Navy Colts, and the “gun that won the west,” Colt .45-caliber ``Peacemaker'' single-action revolver. It was designed for the U.S. government service revolver trials of 1872 by Colt's Patent Firearms Manufacturing Company – today's Colt's Manufacturing Company – and was adopted as the standard military service revolver until 1892. The Colt SAA has been offered in over 30 different calibers and various barrel lengths. Its overall appearance has remained consistent since 1873. Colt has discontinued its production twice, but brought it back due to popular demand.